Introduces & explores key ideas in civics! Can be used for ANY country, state, province, or city! Improves the student's research skills! An All-Purpose Civics Course? What on EARTH is an "all-purpose" civics course? Well, Earth is a mighty big place, with lots of countries, states, provinces and large cities. Wherever you happen to live, your homeland has its own, unique history. It has its own politics and its own religious identity. Your land is a unique land that does not look like any other place on Earth. It has resources (and a lack of some resources), weather, and other natural phenomenon that help make your home different from any other land. Your land has its own people, with a culture they have developed for a long time. No one could create a separate civics course for each place on Earth. And the person who writes an exceptional civics course about the United States, say (because he lives there and understand the country) is unlikely to write an exceptional civics course about, say, Bulgaria (because he does NOT live there or understand Bulgaria). Steps wanted to provide a civics course that would work well for any place on Earth. Here it is! An "all-purpose" civics course that covers the history, politics, culture, geography and topography, industry and business, current form and powers of government, holidays, flags, and vows...all of the important issues that a civics course should cover. We accomplished this by using a two step approach in almost every lesson. 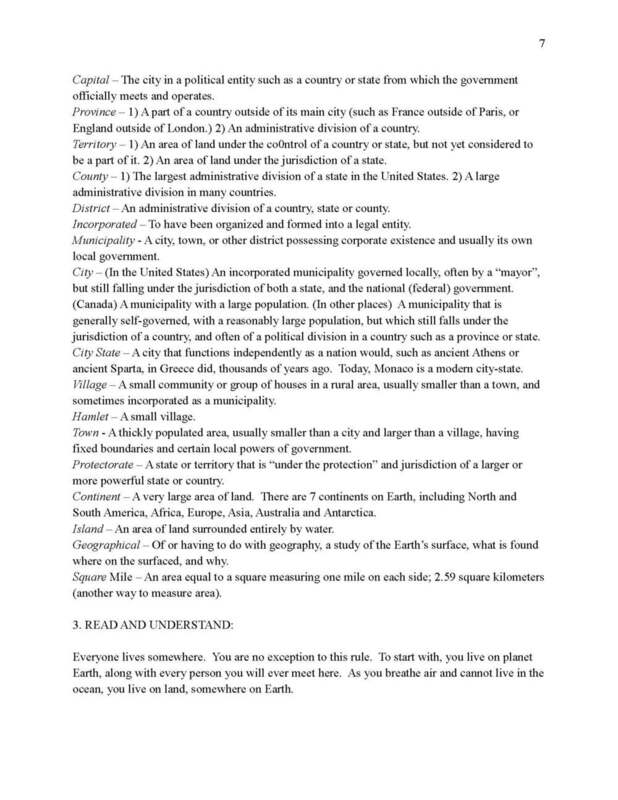 - First, using Steps educational tools (locating places and defining terms the student reads), we prepare the student to read an article explaining an aspect of civics, be it government, economy or what have you. That "area" of study is carefully explained in the article, so that the student is provided a general understanding of the subject. -Second, through the use of directed research , the student discovers for himself the particulars of his own homeland. An example: one lesson plan carefully covers the various ideas of politics today (democracy, socialism, communism, dictatorship, etc). That covers "step one" - an explanation of a concept. Then, step two - directed research - the student is provided ideas for Internet searches and research to discover exactly which form of politics the land under discussion uses. The student then writes, describing his discovery and his response to it. In this manner, the student gets an overall idea of an aspect of civics and then he applies it to the place in question to get a specific understanding of that place. -That he probably will have already done either our Step 4 Advanced How To Do Research or Step 3 How To Do Research, though we do provide enough direction that the student who has not done one of these courses will "survive" civics. Additionally, we tend to take (as in all our courses) a creative approach to the subject that demands of the student his own notions and opinions. In this manner, our All-Purpose Civics Course will also engage the student's interest and intelligence. Here is a civics course that avoids patriotic fervor in favor of allowing your student to discover the facts and evaluate them for himself. If it's indoctrination that you're looking for, this isn't the right course for you. We provide the student an overall understanding of civics, and then direct him to sources where he can uncover the facts about his own nation, state, province or city. The student will decide, once all the facts are in, what he believes. An examination of the culture of the place of study, including architecture, the arts, sports, foods, religion, language, etc.